An official at the Overseas Private Investment Corporation, a federal agency under the guidance of the State Department, wrote a memo on Jan. 26, 2010 to her superiors recommending funding for a construction project in Haiti. According to the proposal, Miami businessman Claudio Osorio and his company InnoVida would build homes on the island using low-cost proprietary panels. Lynn Tabernacki, OPIC’s renewable energy director, noted in the report that InnoVida had "U.S. persons of political influence that are able to assist in advancing the company’s plans." "For instance, former President Bill Clinton is personally in contact with the Company to organize its logistical and support needs," wrote Tabernacki. "Secretary of State Hillary Clinton has made available State Department resources to assist with logistical arrangements." Additionally, the Clinton Global Initiative had "indicated that it would be willing to contract to purchase 6,500 homes in Haiti from InnoVida within the next year." What was not explicitly stated in the memo, but known to OPIC officials at the time, was that Osorio had a prior relationship with the Clintons. Days earlier, the businessman had shown Tabernacki a video of Bill Clinton speaking at his home in 2007. The speech took place during a fundraiser for Hillary Clinton’s presidential campaign that Osorio hosted at his Star Island mansion. Osorio was also a Clinton Foundation donor, contributing between $10,000 and $50,000 to the organization. Additionally, he had hired Clinton’s 2008 finance director Jonathan Mantz to lobby OPIC for the loan request. Less than 24 hours after Tabernacki’s recommendation was sent, OPIC approved a $10 million loan to InnoVida. But the homes in Haiti were never built. By the following year, InnoVida had declared bankruptcy and its owner had caught the eye of both the Securities and Exchange Commission and the FBI. In 2013, Osorio was sentenced to 12 years in prison for wire fraud and money laundering connected to the Haiti house-building scam. He was accused of cheating investors out of $40 million, using the money to pay for a Maserati, his Miami mansion, and a ski chalet in Colorado. The existence of the OPIC memo was first reported by the Washington Free Beacon last summer, but the agency declined to release the document until now. The 25-page report indicates that Clinton may have used her position at the State Department to help donors to her family’s foundation. The State Department declined to comment specifically on whether Clinton directed any department resources to support InnoVida. A State Department official said it was not typical for the secretary of state to be personally involved in an OPIC project. "The Secretary of State is not involved in Overseas Private Investment Corporation (OPIC) projects, but U.S. embassy personnel like economic officers, and most importantly transport and security teams, can play a crucial role in OPIC’s development support process as well as OPIC’s ability to visit project sites," said the State Department official. "The need for these logistics assets can be particularly useful in places with undeveloped or damaged infrastructure." According to the OPIC memo, the InnoVida project would be largely dependent on NGOs making bulk purchases of the homes it built. The report said groups such as World Vision and Habitat for Humanity had expressed interest, but implied that talks were furthest along with the Clinton Global Initiative. Two weeks after proposing the project, InnoVida had already "provided design plans to CGI and began construction of composite panels for construction of an infirmary and a school building to be immediately shipped to Haiti," according to the report. In addition to the Clintons, the memo said the company was in talks with other influential political figures, including General Wesley Clark, George Soros, and the first lady of Haiti. "Wesley Clark is arranging for military transport of the initial structural panels; Steve Green (former CEO of Samsonite Corporation and former ambassador to Singapore [under Bill Clinton]) will provide large space on ocean vessels when necessary to ship the factory components," wrote Tabernacki. She said the company was still looking for a project site, but had "received offers from both George Soros and World Vision, who have warehouse space in the country." The report also noted that InnoVida’s board included former Republican presidential candidate Jeb Bush and Clinton’s 2008 national finance chair Chris Korge. During the trial for InnoVida’s chief financial officer in 2013, Tabernacki testified that her memo was based on claims made by Osorio and other representatives of InnoVida, and she did not go out of her way to substantiate them before the loan was approved. Other testimony from the trial also supported the memo’s claim that Bill Clinton was personally assisting InnoVida. An attorney at the prominent Florida law firm Shutts & Bowen testified that Bill Clinton reached out to friends at the firm to ask it to represent InnoVida in its loan negotiations. OPIC approved its loan to InnoVida just two weeks after the company proposed the project. Officials said the process usually takes months or years. The agency also waved its requirement for the company to turn over independently audited financial records up-front. Instead it relied on reports drafted by InnoVida’s chief financial officer, who was also sentenced to prison time in connection to the Haiti project. The OPIC memo noted that Osorio had previously run a major tech company that went bankrupt after it was sued by shareholders for manipulating its stock prices through accounting fraud. But the memo downplayed the issue, arguing that, "this failure was only one of innumerable technology companies that suffered bankruptcy when the tech bubble burst." 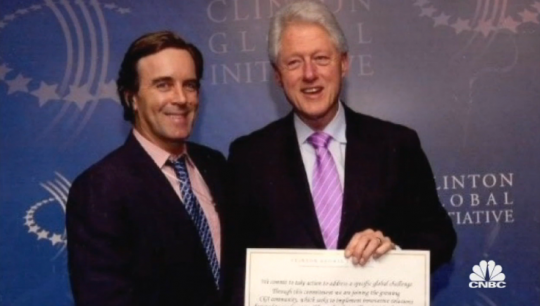 The National Legal and Policy Center, the government watchdog group that first uncovered the Clintons’ involvement with InnoVida, has called for an investigation into OPIC’s handling of the loan. "This case represents a new low in the misuse of public funds by Clinton allies," National Legal and Policy Center chairman Ken Boehm told the Free Beacon last July. "There must be an investigation into why this Clinton donor was using a law firm recommended by Bill Clinton and one of Hillary Clinton’s top fund raisers to improperly obtain millions from the Overseas Private Investment Corporation."